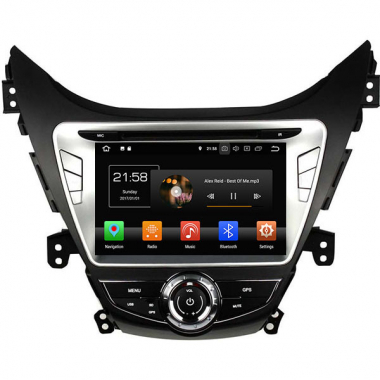 Hyundai Elantra stereo upgrade with navigation system is available for 2011-2013 year Hyundai Elantra, 2014-2015 Hyundai Elantra, and 2016-2018. They are with different dashboard so the stereo navigation head unit are also different. All of them come with car DVD player, GPS navigation, Bluetooth, FM/AM car radio, WiFi, Mirror-link, CAN-BUS, USB, Apple carplay and Android auto optional. You can send us the manufacture year and a dash photo of your Hyundai Elantra for us to check, so we can tell you which is the correct head unit for your car. For 2011, 2012 and 2013 year Hyundai elantra navigation system, it's built-in with 7 inch HD capacitive touch screen, for 2014-2015 and 2016 to present year Hyundai elantra, the screen is HD 8 inch. If you need larger 10.1 inch touch screen, we also have it but it's not with DVD player included. All are with latest Android 8.0 system, Octa-Core CPU, 32GB ROM+4GB RAM.